A piece of art found along side the beach La Caleta. 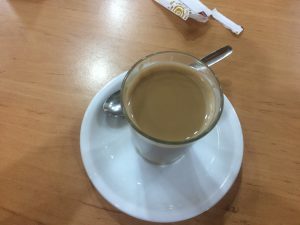 about all the information that I have been able to recall and the way that my knowledge of the Spanish language has grown. I cannot help but think of how satisfied I am with this experience and how it has helped me to become more understanding of yet another cultural. I made so many friends here in Cadiz; those who will remain solely in my memories and others who’s contact information I have taken down. During the trip, I have spoken all four of my languages within the city’s boundaries, I have stepped out of my comfort zone to butcher a foreign language, and I have allowed myself to harvest the full potential of the experience. 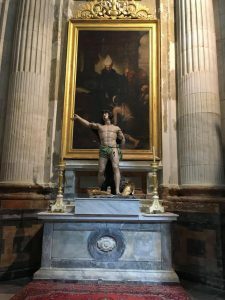 I took enough photos to fill an album, I shopped enough to start a new wardrobe, and I learnt enough Spanish to establish a momentum towards fluency. Three weeks do go by quickly. 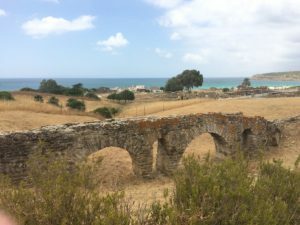 of our excursions and activities, from the tours, to the towers, over to ancient roman ruins, wine tastings, and then to the kitchen to learn how to make tapas. Being a part of the additional class led to a higher level of cultural immersion. 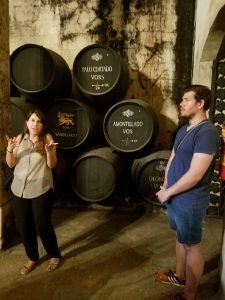 On top of the surrounding atmosphere, we touched upon the history of Spain and the way that this history has helped to form what is now contemporary Spain. Topics such as politics, economics, arts, culinary, and the environment. Due to a background in economic studies, it was the state of the economy that intrigued me the most. In fact, the subject surrounding unemployment and its current results is was I find the most interesting of all. The unemployment rate is 18% but much higher for individuals under the age of 30. By having public and affordable schooling, many young adults prolong their studies. Unfortunately, even with advanced degrees, it is still very difficult for them to find jobs. This then forces these young adults to either accept underemployment or to seek employment in a fellow EU country. This is a very big issue that Spain is having now. A topic that I will try to challenge in a research paper that I will be writing, focusing on the economical state of Spain, both in the past and present. 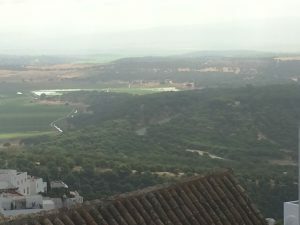 A sight from the Cathedral tower. I wish I had more time to spend here; the last thing I want right now is to leave. Three weeks is an odd amount of time. It is too long to be considered just a vacation but then too short to get comfortable. By the time that I am entirely confident that I can effectively communicate with a Spanish speaker from the street, I am two days away from getting on a plane and flying over to France; a country who’s language I have forgotten trying to learn Spanish. If I could change any part of this trip, the entirety of it, including France, I would have extended the dates a little bit more so that I could incorporate other destinations and turn it into a small tour. I really wanted to visit Barcelona, and possibly Madrid, among other European countries. I think I might be addicted to traveling. No experience is like the next and I would like nothing more than to spend the rest of my days experiencing life. My experience in Spain has been like no other; unlike the rest of the students here on this Spain trip, I’m taking an alternative course. Instead of taking classes, I’ve gotten the opportunity to work at the local food pantry. 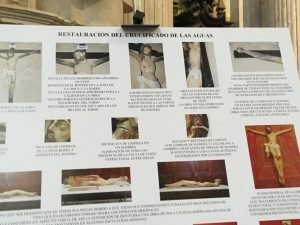 Over the past two weeks I have been able to use the Spanish I’ve learned and help the people of Spain with something that plagues the whole world. 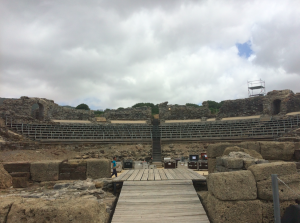 Not only have I been able to learn the history, cultural parts and language of Spain but I’ve been able to see the behind the scenes that most tourist don’t. 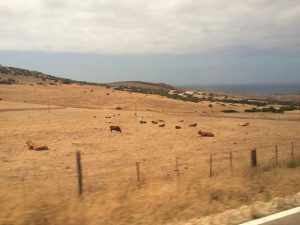 While Spain is a wonderful country and I recommend everyone to visit, it still has its problems like any place in the world. You see they’re challenged with a high unemployment rate. This means there are many people who can’t afford a house, running water, or even a decent meal. People can often be found sleeping on the streets, going up to strangers with cups or hats and asking for money, or with signs that explain their situation. Thankfully there are some organizations set up to provide people with food. For me it meant that there was a way for me to give back to this beautiful city and learn the language in a different way. Every day at the food pantry is a busy day for us. Some Days we’re cooking chicken with rice and vegetables, other days we’re handing out nonperishable foods. However, on most days we provide two types of sandwiches along with a liter of milk along with bread. 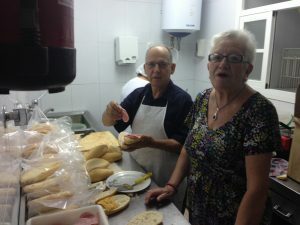 The bread is donated from local bakeries that we pick up that night before or the morning of. It is a nice show of compassion that these local bakeries donate their bread instead of just selling it at a lower price until it is finally too stale to be edible. It shows that there is a strong sense of responsibility in the community to help those less fortunate than themselves. This is something that back in the United States that gets glossed over unless there are organizations that reach out to the public for support, but even then it can often go unnoticed or unheard. All it takes is one group of people to start standing up, and to never back down and make a difference in the lives of those struggling. When at the pantry, and whenever someone finds themselves working with food, preparation is key. On days where we’re giving out nonperishable food we have to first pull all that we need from storage. The way the food pantry is set up however is scattered across 5 different buildings along the street. The main building is where we do most of the cooking, assembling, and distribution of food. The other 4 buildings are mostly for storage of clothes and various foods such as canned beans, crackers, rice, potatoes, onions etc. This means that to prepare for the days when we distribute food, we have to go to 4 different building to gather all the food we need. Thankfully they have a shopping cart which makes preparation go by a lot faster. When it comes to actually cooking, a gentleman by the name of Jose takes care of most of it. Most of the people don’t speak English so understanding them was a challenge for me at times. It usually takes them a few times of repeating themselves to understand them. However, everyone has been extremely understanding and supportive of the fact that I was completely new to the language and many even would take time out of their day to try and teach me a word or phrase or two. It was incredibly inspiring to see how compassionate and selfless these people were. Everyone at the food pantry has a role to play and everyone one plays it very well. Along with that they’ve taken many dull moments and turned them into teaching experiences and everlasting memories. 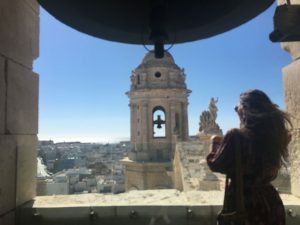 My experience in Cádiz has been a truly adventure, I am taking two classes in Spain, they are a methodology class in Spanish called “Nivel Superior” and a “History of Contemporary Spain” class. These two classes are responsible in making me quite busy during my time in Cádiz, I must admit. I really like the two of them, however it is my first time taking a methodology class, it is a very exciting and diverse class, for example we have students from Cádiz, San Fernando, Chiclana but we also have from Russia, Italy, and Germany and of course me from the Dominican Republic. 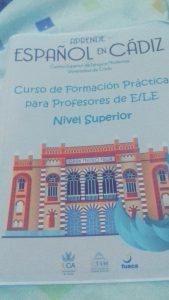 This course is taught in Spanish and is called “ Curso de Formación Práctica para Profesores de E/LE , Nivel Superior”. It essentially translates as a practical formation to teach Spanish as a foreign language, for superior levels. 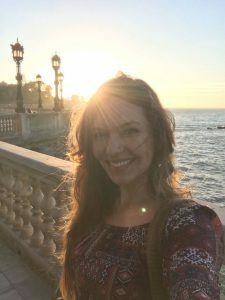 I love this class because I have classmates that have 25 years of teaching experience, others who have traveled outside Spain to teach Spanish, and others like myself who just finished their undergraduate degree and are starting or about to start their master’s program. So far, in this course we have worked in groups and have created different activities including a plan of study for an indicated level of Spanish to teach. 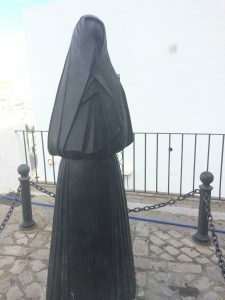 For example, my group and I chose to create a plan of study for a B1 course which is the equivalent to a 300 level Spanish course in the U.S. My group and I focused in the imperfect and imperative and used it as main topic of our unit, I was not able to present along with my group because I had a program excursion to Tarifa, Vejez, and Bolonia, but at least I contributed to the creation of the plan. We all agreed to keep the unit very interactive, since learning another language can be sometimes frustrating we made sure to pick activities that were both instructive and fun. Since this project, we had to adapt a text to different levels of Spanish classes, for example I learned how to adapt the same text to a B1 level to a A1 or A2 level. It goes as following: level A1 is the elementary, A2 the basic, B1 is the intermediate, B2 the advance, C1 the superior, C2 is the level where we help polish everything the student has acquired. For our last two project, we have to read the material and for this coming Monday, perform an oral evaluation to actual students at the school, I am looking forward to this activity since last time I was in a similar position was two years ago in 2015, when I worked as a Spanish teaching assistant for the MIT/Wellesley Upward Bound Program. Lastly, for our final project we need to work in groups and create and design a hypothetical exam we would give to a Spanish as a Foreign Language class. This, is both challenging and interestingly fun to do, because as teachers we would have to keep in mind how to stay in balance for our students, we would not want to make the exam too easy or too hard. Because ultimately, we want our students to learn Spanish and not intimidate them or make them feel inferior. I trust we would make a great final project and of course do very well presenting our final product to the class! Overall, I have learned so much! In class and my teachers are amazing, both Foncu and Macarena are great teachers, today I learned that Foncu and I have the same favorite author, Eduardo Galeano. He informed us that next week there will be an homenaje to Galeano at the Café Teatro Pay Pay, which I definitely plan on going!!! Where my classmates and I discuss class debates, prepare for class and talk about a variety of other topics over a nice cup of Café. 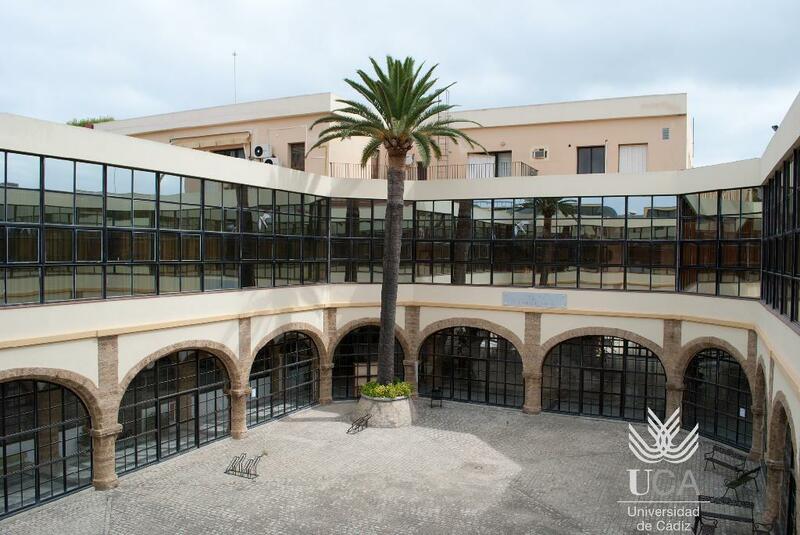 Today, we finished our second week of our classes at the University of Cadiz. Divided amongst various classes, those in my class, along with myself, have learned many tenses essential towards establishing the foundation for a future of fluency in Spanish. Our two wonderful professors, Almu and Albierto, have taught us the past, future, and conditional, answering any questions we may have, with patience. 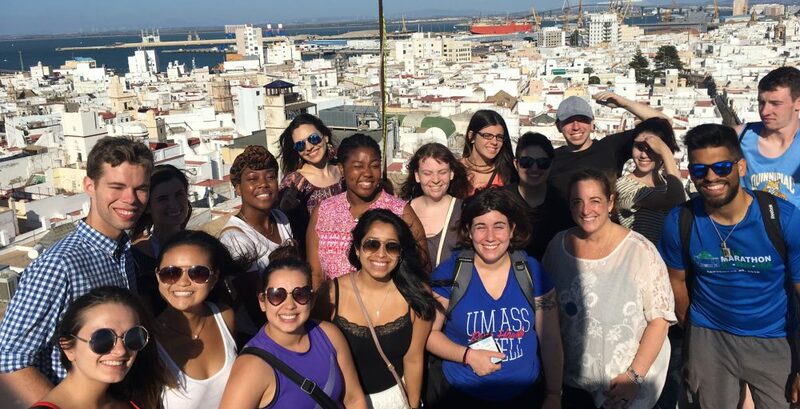 Throughout the past two weeks, many of us students have seen an increase with our confidence in the Spanish language and look forward to continuing our education after the program comes to an end. 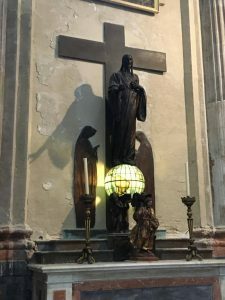 Some great ways that have helped immerse us into the culture are the many excursions we have been on so far. 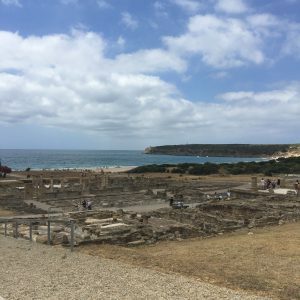 Within the province of Cadiz, we took a journey to Baelo Claudia, which is an ancient Roman archaeological site, containing Roman remains from the period when Spain was a part of the Roman Empire. To better grasp an understanding of many of the topics, they are researched and presented on by the students of the additional class. A classmate, by the name of Phil, and I gave the presentation on Spain in the Roman times. 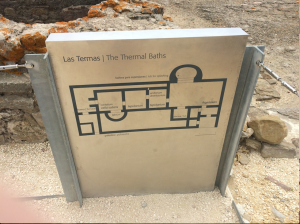 Below is a photo of the ruins. 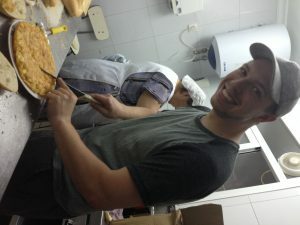 Earlier in the week, we all took a cooking class to learn how to make tapas. And yesterday, we took a ferry to the Port of Santa Maria and partook in wine tasting and sightseeing. Among the various activities, I have noticed some – I do not want to refer to them as culture shocks – differences. (I, personally, find myself to be very free spirited and openminded that the differences I experience here, in comparison to the United States and England, are no less stunning than seeing the odd things that people back home do.) 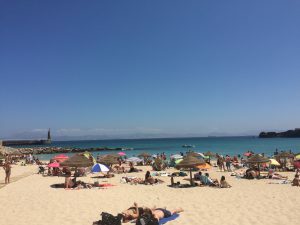 Anyways, I think one of the two big differences for me are the hours in which the Spaniards eat their meals, for instance dinner is eaten after 21:00, and the permittance of toplessness at the beaches. Another interesting occurrence is the presence of young children at the park across the street after midnight/one in the morning. The community here is interestingly enough: liberal, diverse, and, for the most part, safe. One experience I really enjoyed since being here, was being at the bar one night and having a woman approach me, speaking English. First, she assured me that she was not trying to sell me anything, and then began to tell me that she was, at that time, working. Her job was to conduct a meet-and-greet situation at the establishment. She was handing out stickers of different flags from different countries. The purpose was to wear the flags of all the languages you spoke and to walk around meeting new people interested in learning or helping teach the language. 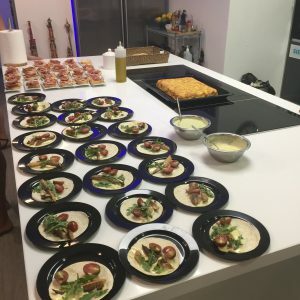 It was quite a nice activity to partake in because not only did I get the chance to practice my Spanish, but I also got the opportunity to practice my French, and help someone with their English – all in one night. With so much accomplished in just two weeks, I cannot wait to see what next week has to offer. 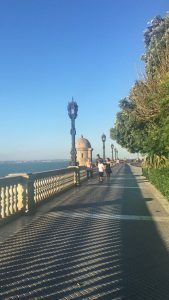 Across the shore of Cadiz is a little town know as El Puerto de Santa Maria; a beautiful hidden gem with historical treasures. 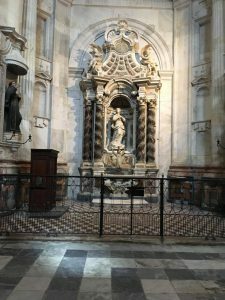 At first glance, Santa Maria doesn’t seem to have too much going on, but as I share with you my experiences from today, I am sure you will see why its such an important city to the providence of Cadiz. 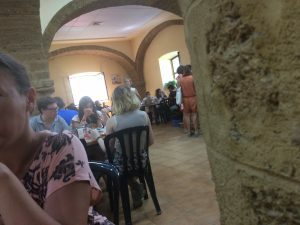 Today we were able to explore Bodega Caballero and the Castle of San Marcos (Castile de San Marcos) and sample a bit of the wine in the end. A “bodega” is the spanish word for a wine cellar that stores the wine as it ferments over the years before reaching your glass. 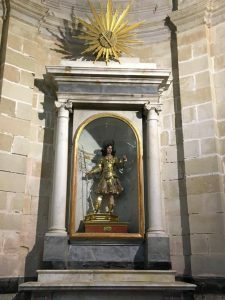 Santa Maria is part of the triangle of Sherries in Andalucia, Spain. 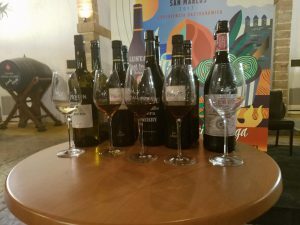 Including Santa Maria, Jerez de la Frontera, and Sanlúcar de Barrameda are the cities that support the manufacturing of wines that you are able to taste across Spain and mostly throughout Andalucia. To begin our tour, we walked though the outside gates entrance where we discussed the history of the Sherry chain. 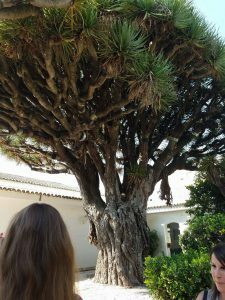 Fun Fact 1: Outside of the main entrance was one of the three only trees left of its kind; the Dragon Tree. Upon entering cellar the rich odor of the fermenting grapes and yeast invites you into the magic of wine production. First Veronica, our fabulous tour guide, explained there are 3 different grapes used to make the multitudes of wines created here, we only focused on one. From that one grape, they are able to make 5 different types of wines based on the age of fermentation. They compress the grapes, transport the juices to wooden barrels, add various ingredients to help the process such as alcohol and yeast and wait. Fun fact 2: the barrels that the wine is placed in is 200 year old American Oak! 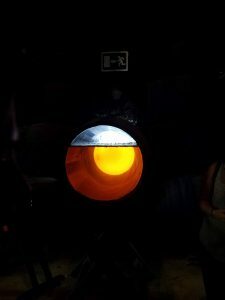 This shows the inside of the wine barrels. Top layer is the yeast layer that helps indicate if the wine is ready or not and how much alcohol may be contained. An important part to note about this process how the wine is mixed. On the bottom level, is the oldest and the youngest is on the top. In order to make sure all the wine is the same, 1/3 of each wine is mixed with each other on the various levels. The longer they age the wine, the darker/ redder the wine becomes. Barrels on barrels on barrels of wine. Boy did it smell like yeast! 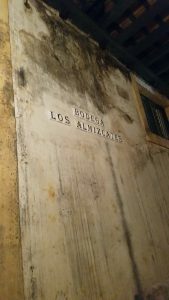 Proceeding through the cellar, we are pointed to a street, “Bodega Los Almizcates” that once was used by inhabitants of the city before it was closed off within the storage space of the cellar. This old street progresses to another smaller room which contained wine that fermented for 20 and 30 years. Whats special about this room is that the wines aren’t mixed from top to bottom like in first room, but rather from left to right. I thought of this room as the “royalty room” as the barrels contained the “plaques” of autonomous people. 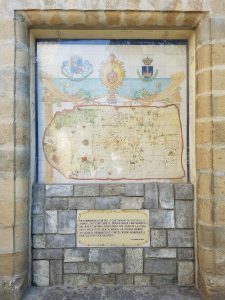 Fun Fact 3: On our way to the Castle of San Marcos we saw one of the few first maps that included North America. 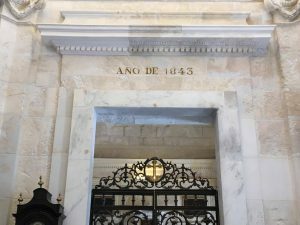 Christopher Columbus is not only well known in America just of his “discovery” of America, but it well respected by the people around Andalucia for leaving from Spain for his more well known trips. 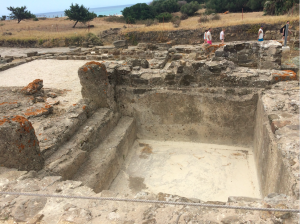 A lot of his time was spent here in Santa Maria planning trips and receiving the funds from the queen to make his voyages to the New World. Approaching the Castle of San Marcos looks like a picture out of the medieval times. Once you pass the entrance is when you are able to see various influences come to life in the building. To summarize what Veronica said about its history, the Castle wasn’t a castle, but a structure that changed over time with whoever was in control. 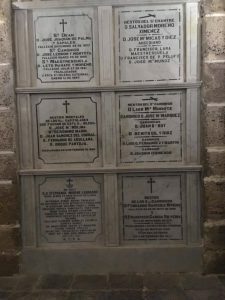 Majority of the changes after the mosque was under the ruling of King Alfonso. 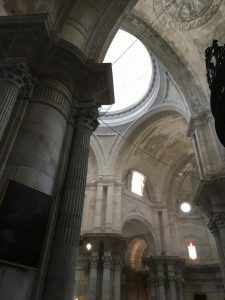 At first, the building was a roman temple, then converted to a mosque once the Muslims ruled, then converted to a christian church, and then finally a castle. At the right of the entrance is a fountain where the muslims washed their feet and hands before entering the main room where remains of the muslim decorations still are. 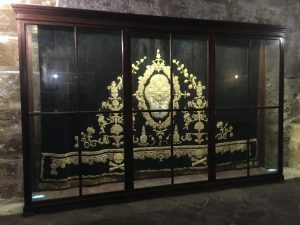 Adjacent to the praying room is a sacristy which was built in the 15th century. 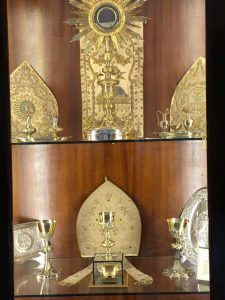 The sacristy was the most holy room of the entire building because this is where the sacramental gift remains here most of the time. 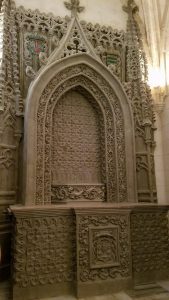 The alter of the sacristy has carvings of gargoyles to protect the house from evil spirits that may have remained from the wars and violence happening outside of the building. It was built by a prisoner who spent 7 years creating it to lessen his sentence. Unfortunately, he passed away after completing the structure. At the end of our castle tour, we had our wine tasting. 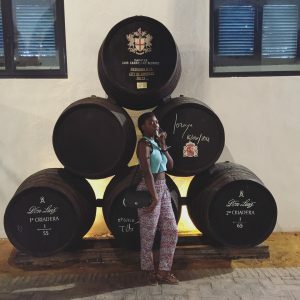 Im a newbie to the entire experience so it was quite fun to try the traditional wines of Cadiz. 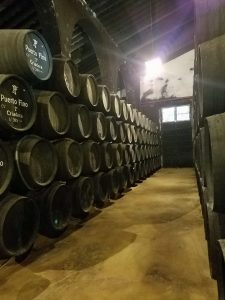 Sherry wine is something here in Cadiz the people take pride in having. 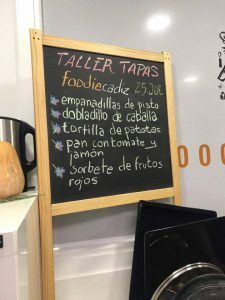 Pretty much what they create here is the primary wine found in local restaurants to accompany the “tapas” (like appetizers, but its the meal) served. Cream: Which is a combination between the Oloroso and Pedro Ximénez. Dark red hue. Takes 14 years to make. Pedro Ximénez: The fruitiest of all; sort of a raisiny taste. This is due to the process of how the wine made. In comparison of how sweet it is, there are 400 mg of natural sugar from the grapes in a 1 liter bottle. Dark red hue. Takes 7 yeasts to make. Vermut: Although its new one, I didn’t like the flavor of this one too much. It has a much smoother flow compared to the rest but a flavor I wasn’t a fan of. Dark red hue. Takes 7 years to make. 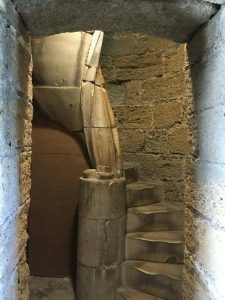 Well, I hope you enjoyed learning a little more about the craft of wine and the Castle of San Marcos. 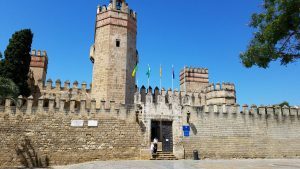 If there is ever the chance to visit Cadiz, be sure to take a little day trip as well to this antique town as well. 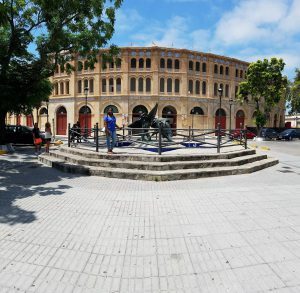 Although not mentioned before, but there is the Plaza de Torros here which is another cool place to visit as well and various restaurants with excellent fish and seafood plates. Hello it’s me! I am so glad I was able to come visit you, I’ve been fortunate enough to visit Europe for the first time. I’ve been able to explore the varieties of neighborhoods as well as emblematic site of the city. It’s only been a week and I already love it, because it’s charming and majestic. 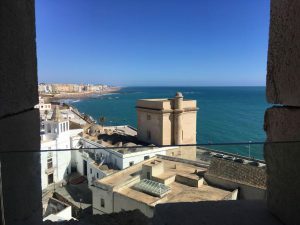 Beautiful, Cádiz you are filled with rich history being one of the oldest cities in Europe, founded in 1100 BC, later becoming a territory occupied by the Romans, Muslims and later by Alfonso X and home of the Spanish Navy. Today, Puerta de Tierra built in XVIII separates the old town of Cádiz with the new town. Between the old and the new Cádiz, I rather much stay with the old due to the romance and beauty of walking through out the small cobbles streets while looking at the Spanish style architecture is simply spectacular. 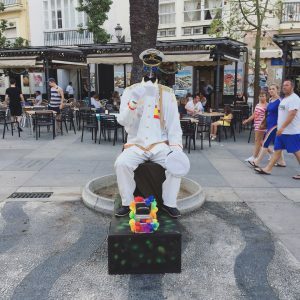 The iconic plazas all over the city are a great place where families and friends get together to simply enjoy the pleasures of life and to enjoy a nice afternoon. My favorites so far, are Plaza San Antonio & Plaza de Mina since it’s so close to my house and it’s filled with trees, flowers and remarkable arquitecture. 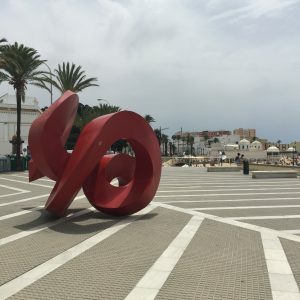 A quick anecdote is that when I first arrived to Cádiz last Sunday, my luggage never arrived, as a result I had limited change of clothes, I was pleased to know I had brought a change of clothes in my backpack for just in case. However, everything I brought was in my luggage and a few days passed by and still no luggage. Fortunately, the airline agreed to reimburse me for the money I had spent on a few clothes piece and personal items while I waited for the luggage to arrive. By Wednesday, I received great news! The airline found my luggage and had it delivered to my house. I was glad and able to say that thanks to my optimistic attitude I was able to remain calm and collected despite the fact I didn’t have any of my belongings with me after a long tiring trip. Yes! It’s crucial to always have a positive attitude despite the obstacles life presents to you, I partly credit this good attitude to my Buddhist mediation practices. To tell the truth this unexpected event of my luggage being lost for a couple of days did not prevented me from enjoying the beauty I had in front of me. 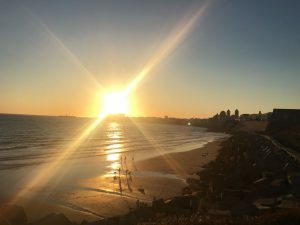 Cádiz, surrounded by two seafront forts, San Sebastian and Santa Catalina, because of the seafront Cádiz has the luxury to offer magnificent sunsets which of course are my favorite part! 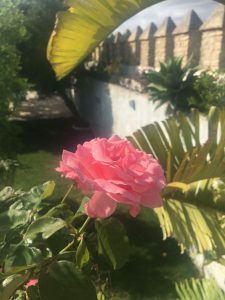 I can appreciate as I walk by Campo del Sur and head to Playa la Caleta, de la Victoria or los corrales. 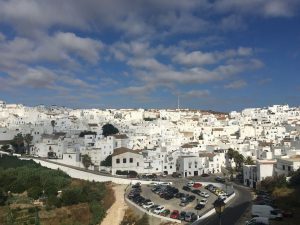 On Friday we went to an excursion to Bolonia, Tarifa and Vejer de La Frontera, personally I enjoyed the beautiful white scenery of the houses in Vejer. It was truly an amazing experience not to mention I’ve seen Africa from Tarifa! 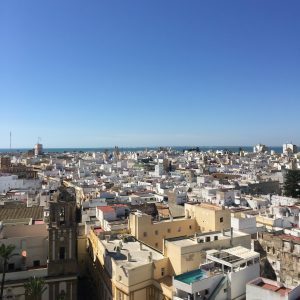 Cádiz, to me you are unique because you have everything I look for in a city, simplicity, elegance, romance, history, culture, art, beach, nature, friendly people and delicious food. 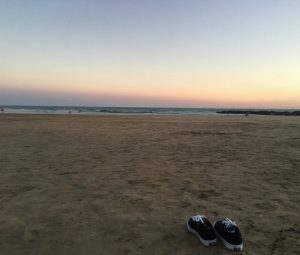 Cádiz es muy guay!! First, the Cathedral. We enter and receive audio devices that will guide us through the Cathedral. 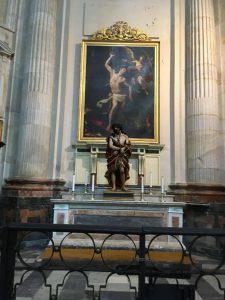 We visit first the Chapel of the Assumption, the first of the pictures shown below. 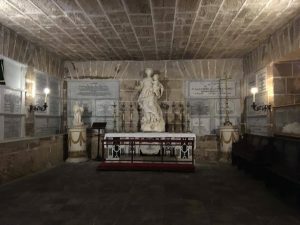 Next is the Saint Sebastian Chapel. We notice then the beautiful high ceilings. 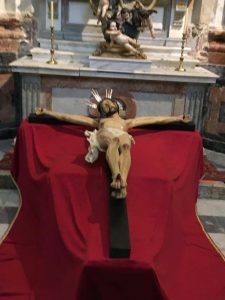 We then walk to the center of the Cathedral, and view the impressive High Altar. 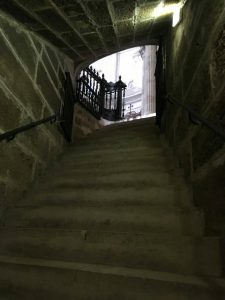 You see the entrance to the Crypt and we decide to descend into the dim light of the underground space. 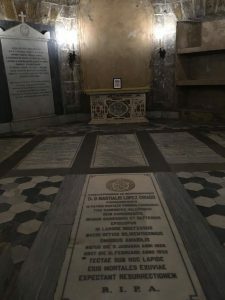 We observe tombs and other artifacts and learn their history from the audio tour. 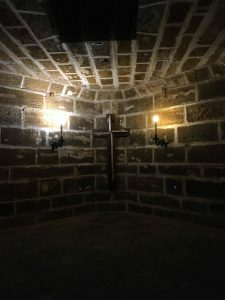 Emerging from the Crypt, we continue our path around the Cathedral, stopping by the Saint Tomas of Villanova Chapel, the San Servatius Chapel, and the Chapel of the Relics/the Chapel of the Tabernacle where we keep quiet, as silence is mandatory. 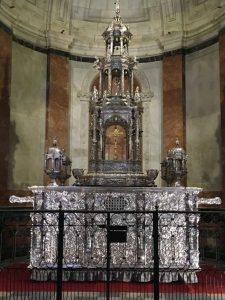 We also view the Saint Germain Chapel, The Corpus Christi Monstrance, made entirely of silver, and the Saint Joseph Chapel, where we learn about the restoration of the Crucifix. 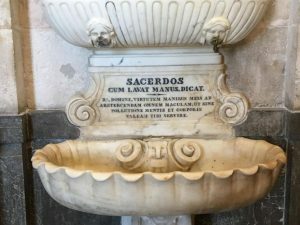 We then enter the Sacristy, where we view relics of the past, as well as a hand washing station with a Latin inscription. 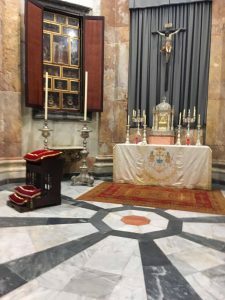 Finally, we look at the Chapel of the Most Sacred Heart of Jesus. Exiting the Cathedral, we make our way to the Cathedral tower, and make the climb up the spiral ramp to the top. At the very end of the ramp we ascend a spiral staircase, and what a view! The tan and white buildings and the gorgeous blue ocean lie before us. 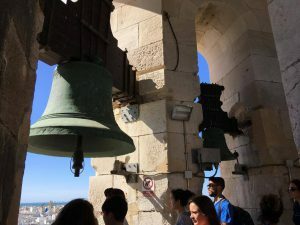 We then notice the three bells of the bell tower, and suddenly a loud pang sounds from one of the bells, startling us. Once we have had our fill of the beautiful scene, we return to the ground. Next on our agenda is el Torre Tavira. 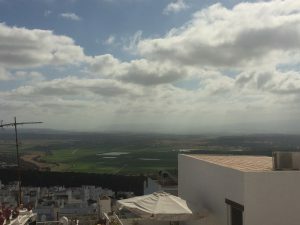 We walk there from the Cathedral and purchase tickets for a visit to the camera obscura, in the Torre Tavira. We climb with our tour guide up to the level where we view the picture. 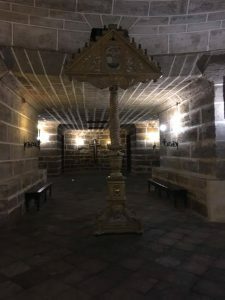 Our guide explains to us that a camera obscura, or a pinhole camera, gives a picture in real-time, made by light reflecting off of a mirror which projects the scene onto a blank screen. 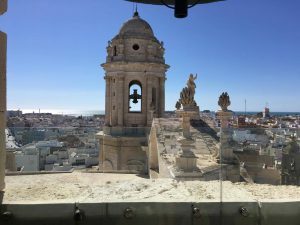 Our guide turns off the lights and opens the window to the mirror, letting the light in through the opening in the ceiling and revealing a panorama of Cádiz. Our guide turns the device in a circle, and we see all of Cádiz, North to South and back again. Our guide explains that raising or lowering the platform with the screen on it puts into focus different distances. 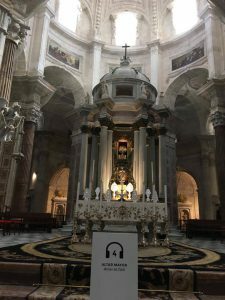 We are given a virtual tour of the city, from the Cathedral to the Gran Teatro Falla, from the Castillo de Santa Catalina to the Punta Candelaria, and from the Mercado Central to the old vineyard. 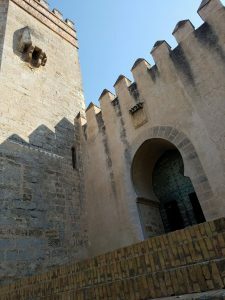 We learn interesting facts, such as the different types of towers in Cádiz, and why there are so many (to see when ships were arriving with goods to sell). We are told that there is only one natural road out of Cádiz, and that without it the city would be an island. Thank you for accompanying me on our trip today! I had a great time and I hope you did too. 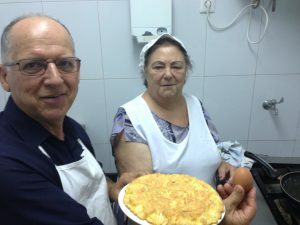 My stay here in Cádiz thus far has been one of the most wonderful experiences of my life. It is still early in my stay, but already I have learned so much. 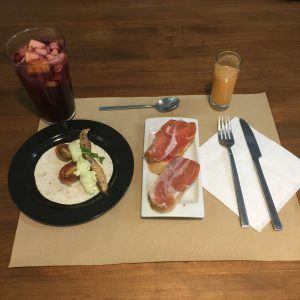 Aside from practicing my Spanish I have practiced living with another culture and getting accustomed to the customs of the people of Spain: greetings, foods and eating at different times in the day, and so much more, things that are all foreign to me. 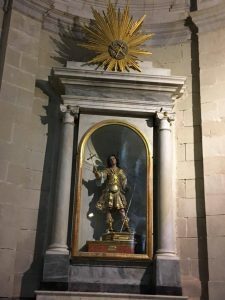 I have learned about the rich history of the Iberian Peninsula and how this formed the Spanish nation as we know it today.